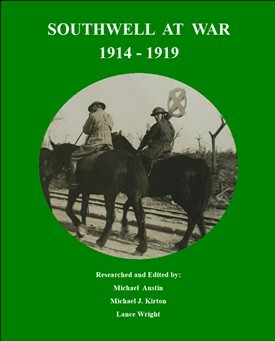 Michael Austin, Mike Kirton and Lance Wright, all members of Southwell and District Local History Society, have researched and edited a substantial account of the town in the Great War. Approximately 650 men served in the armed forces and 16% of them died in the conflict. The names and biographical details of the majority of the men are published in the book. News stories for the 5 year period have been extracted from the Newark Advertiser, which chronicle life in the town during the period and include letterds from men serving at the front. Further chapters describe life on the 'Home Front' and in the schools in Southwell. There is also a chapter of individual stories of heroism and tragedy of individuals who served. The progress of the local territorials who served in the 8th Battalion, Sherwood Foresters has also been extracted from the battalion's war diary. This is a substantial volume containing nearly 350 pages and 136 illustrations.